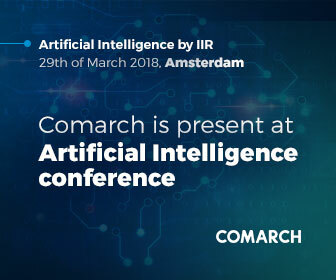 Comarch is present at Artificial Intelligence! We are pleased to announce that Comarch is the partner of Artificial Intelligence! It is a one-day conference held on the 29th of March in Amsterdam. Comarch delegates will participate in the event that brings together key-decision makers in financial institutions such as banks, insurance companies, pension funds and consultancy companies. Is Artificial Intelligence the next big change the financial sector should prepare itself for? The theme of the event is “The next shift in risk and finance”. Thanks to the participation in the Artificial Intelligence meeting, attendees will gain more insight into the AI implementation. What is more, participants will find possibilities and understand limitations of automated decision making. Last but not least, every attendee will obtain more insight into Big Data/AI and how to use them in the financial sector. Artificial Intelligence conference is a great opportunity to share unique experiences and present most successful case studies. The event is full of ground-breaking presentations and engaging round tables sessions. The detailed agenda is published on the event website.